Sarty, Roger. "Rainbow (Ship)". The Canadian Encyclopedia, 16 December 2013, Historica Canada. 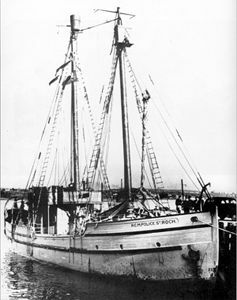 https://www.thecanadianencyclopedia.ca/en/article/rainbow-ship. Accessed 19 April 2019. Rainbow, a light cruiser serving in the Royal Navy from 1891 until 1910, when the Canadian government purchased the ship for the new Royal Canadian Navy. After its arrival at Esquimalt, BC, 7 Nov 1910, its duties included training and fisheries patrol. Rainbow, a light cruiser serving in the Royal Navy from 1891 until 1910, when the Canadian government purchased the ship for the new Royal Canadian Navy. After its arrival at Esquimalt, BC, 7 Nov 1910, its duties included training and fisheries patrol. In July 1914 its appearance persuaded the KOMAGATA MARU to leave Vancouver harbour. From Aug 1914, when powerful German cruisers briefly appeared in the NE Pacific, until early 1917, Rainbow performed defensive patrols. It was sold for scrap in 1920.